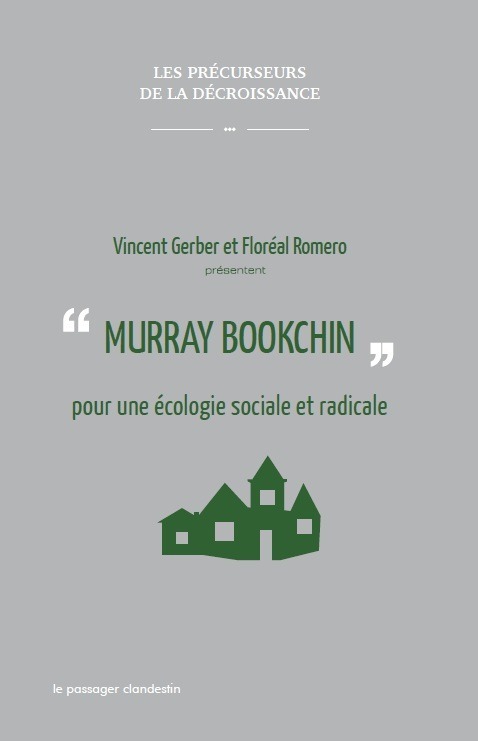 October 16th will be the publication date for our book “Murray Bookchin, une écologie sociale et radicale,” in the series titled Precursors of Degrowth, produced by Serge Latouche. For more information, see my posting here. This project comes up after the publication of my earlier book on Bookchin and social ecology, and Floreal Romero and I worked together on this. The aim of this small book is to present how ideas of social ecology influence (or are similar to) the recent Degrowth movement, and also how they differ. Half of the book is a presentation of Bookchin, social ecology, and their relation to Degrowth, and the other half contains 5 excerpts of articles from Murray Bookchin. The extracts are from “Ecology and Revolutionary Thought”, “Towards a Liberatory Technology”, “Remaking Society”, “Death of a Small Planet,” and “What is Social Ecology ?” The latter two have been translated into French for the first time. Vincent is also translating Bookchin’s Post-Scarcity Anarchism and other key works in social ecology.